Roddy Doyle wrote that “the Irish are the blacks of Europe and Dubliners are the blacks of Ireland and the Northside Dubliners are the blacks of Dublin”. 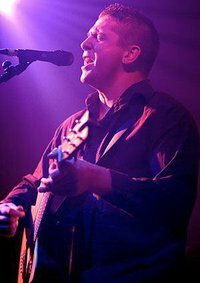 Born in Donaghmede on Dublin’s Northside in 1975, Damien Dempsey is the voice of that underclass and the quintessential Irish singer songwriter. ... An imposing six foot two, Dempsey is a former amateur boxer and a survivor of street gang culture. His youthful audience identify with a singer who has emerged from the rough working class streets with his powerful self belief intact. And his lyrics - “Stevie smashed the delf / ‘cause he can’t express himself / He’s consumed by rage / Like his father at his age” - speak of their shared childhood experiences. But the optimism that he reaches for amidst Ireland’s industrial and social collapse - “I can see the evil, but I can feel the good, shining out to greet me” - is an inspiration to his burgeoning troubled audience. His concerts can be almost spiritual occasions – his fans sing along to every word and look to him as a leader for expressing such intense social and cultural concerns. Dempsey is reminiscent of Terry Malloy the prize fighter turned longshoreman in Elia Kazan’s On the Waterfront – a man whose conscience forces him to speak the truth, despite the consequences of his honesty.